The SR-71 Blackbird is still considered the world’s fastest aircraft, and still holds several speed and altitude records; record speed over a 15-mile course (2,193 MPH), maximum sustained height (85,069 feet), speed record from New York to London (one hour, 55 minutes), and London to Los Angeles (three hours, 47 minutes). An SR-71 crew consists of a pilot and a reconnaissance systems officer. 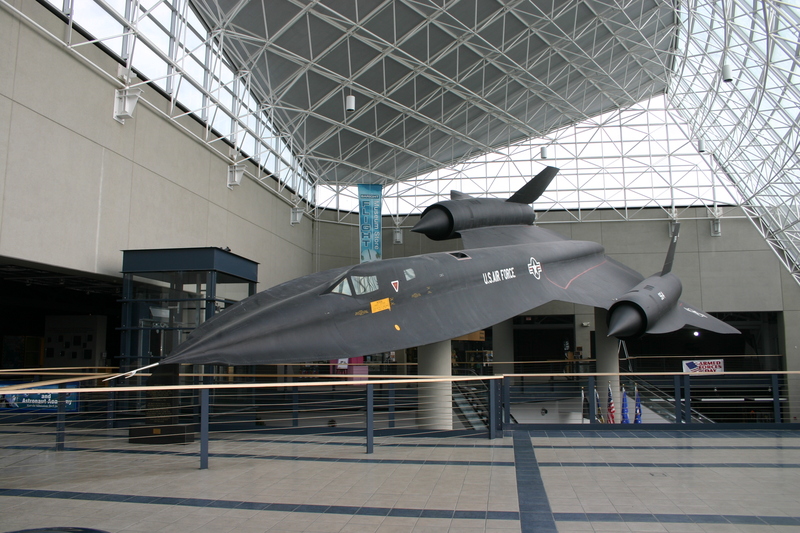 The development of the SR-71 by the USAF and the CIA was shrouded in secrecy, and came into service as a result of a decision by the CIA to acquire an aircraft with a higher service ceiling and a greater maximum speed than the U-2 aircraft. Constructed largely of titanium, it is coated with high-heat emissive black paint and used precious metals (such as gold) components to help retard the 1,100 F degree skin temperature of sustained supersonic flight. Designed as a strategic reconnaissance aircraft, equipment included electronic intelligence collection and radar surveillance systems plus photographic equipment capable of surveying 100,000 square miles of the earth’s surface in an hour. About our SR-71A: This SR-71 was delivered to the USAF on May 27, 1966, and has the third highest flight hours of the fleet. It was delivered to the Strategic Air & Space Museum on March 20, 1990.